La Fête Des Rois (The Feast of the Kings) is a French celebration filled with delicious traditions. The symbolic holiday is celebrated on the 6th of January in relation to the Epiphany; which to Christians marks the official end of Christmas. This feast commemorates the visit of the Magi or Three Kings bearing gifts for the newly born Baby Jesus. For the French, the Galette des Rois (kings' cake) encompasses a big part of it all. Galette des Rois is a cake in the shape of a circle or triangle made with puffy pastry, butter, and filled with almond cream. Hidden in the cake is la fève; a porcelain figurine. Whomever finds this figurine while eating the cake becomes King or Queen for the day. To ensure that there is no cheating during the game, the youngest in the room (often a child) goes under the table and announces the name of the person who will be served each slice as the cake is being cut. There are two different versions of the Galette des Rois. The traditional Galette de Rois as described above is the most common of both and originated in the North of France. In the South of France however, a different version of the cake is served; Brioche des Rois. 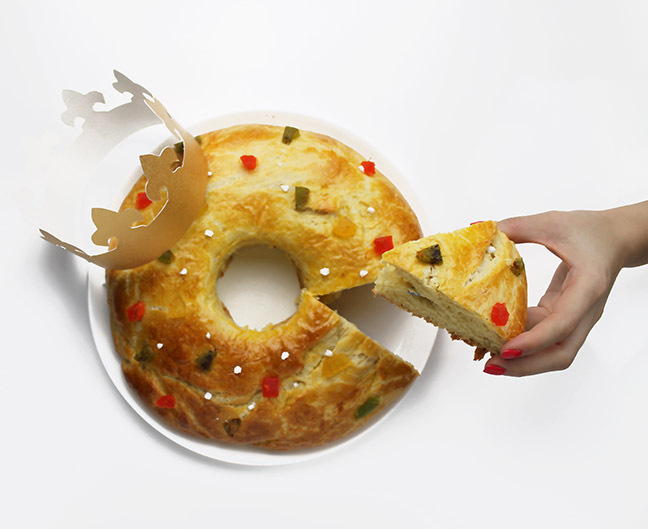 Brioche des Rois is a ring shaped cake decorated with candied fruits. The cake is meant to resemble a crown and the fruits represent the gifts. Both of these versions are enjoyed the same way, and hold the same tradition. To make this delicious cake and experience this French tradition, follow Del's recipe below. 1 bean to hide in the cake. (1) For the pre-dough: warm the milk (at 86°F). Pour the milk into the bowl of a stand mixer and dissolve the yeast. Add the flour, mix quickly. Let set for about 1 hour, covering the bowl with a tea towel. (2) For the dough: pour the remaining flour on top of the pre-dough, then add the salt, sugar, and beaten eggs. Knead the dough in the bowl of a stand mixer (or by hands) for about 5 minutes on low speed, and 5 minutes on medium speed. (3) Add the diced butter, softened at room temperature, the orange zest, and the rum. Mix again for 5 minutes, until smooth and elastic. If not, add a little bit of flour. (4) Cover the bowl with a tea towel and leave for 1 more hour at room temperature, until double in size. (5)Preheat the oven to 350°F (180°C). Form a bowl with the dough and flatten it with your hands onto a lightly floured surface into a circle of about 8-10 inch (20-30 cm) in diameter. (6)Make a hole in the center of the dough with the help of your finger, then gradually expand the center hole, slightly chalking the edges to prevent the dough from sticking. Do not forget to hide the bean inside the dough, from below the dough, closing the edges around. (7)Transfer the dough onto a baking tray covered with parchment paper, then brush with the egg and milk mixture. Sprinkle some candied fruits and pearl sugar. (8)Bake for about 25 minutes, or until the kings cake is golden brown. (9) Tips: Place an empty La Fermière terracotta or glass pot in the center of the cake while baking, to keep a regular shaped circle.